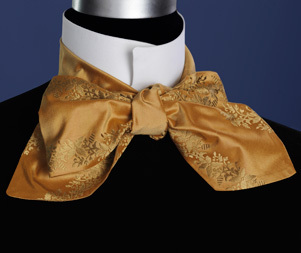 Copied from a period cravat, our Cravats are made in a variety of colours and fabrics. 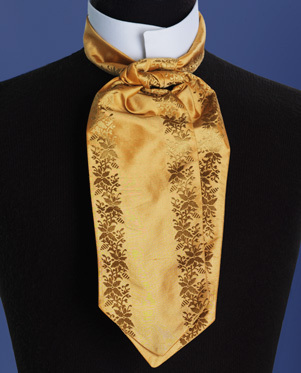 Our Cravat is 2 ½ “ wide with a button hole to pass through and tie. Please inquire about available colours and patterns. Tying suggestions included. Adapted from period neckwear, our Ascots are made in a variety of colours and fabrics. 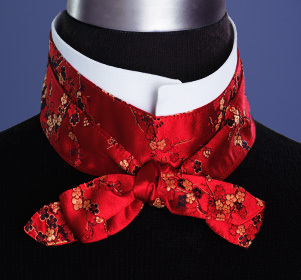 Our Ascot is narrower around the neck and wider for a fuller presentation in front. Please inquire about available colours and patterns. Tying suggestions included.